As I sit here, thirty minutes to the end of this crazy month, I decided to write a reflection on the lessons that have come out of November 2010. I know that after writing almost 300 pages of fiction, you would think that the last thing that I would want to do is write. On the contrary, that’s one of the things NaNoWriMo does for me, it is the fuel that fills my tank for the next 12 months of future writing. What were my November lessons? · I need an outline– Last year I had an idea of what I wanted to write. I even wrote the name of the chapters. This year, I knew what story I wanted, had the title ahead, but didn’t know the development of the story which caused many writer’s blocks and moments of frustration. · Write-ins and Nano community are vital for success– I can’t thank enough my Municipal Liaisons for their support. They kept me encouraged, motivated and challenged to go above and beyond my own goals. I also became more involved in the chatroom and not only was very motivated but I will be laughing at some events for the next 12 months. · Who’s who– I did get my chai latte and my smoothies. I am very appreciative to all of you who in one way or another kept checking on me or supporting me throughout this month. I also saw people fell of the face of the earth because I couldn’t be there for them during this month in the same fashion that I usually was. It’s sad when people can’t support your dreams, but I always like when God does house cleaning. He’s the best! · Motivation– As a child writing was my hobby, when I returned to the writing arena I knew it was my passion, now I know it’s also my ministry, it’s what makes me happy, what I was created to do and as long as God allows me to move these fingers, published or not, I will continue writing. · You don’t have to gain weight just because you’re writing– I tend to eat and write and I have to admit that I did it this year as well. What was the difference? My food choices. I ate more fruit, organic cookies and to my shame a lot of diet soda. Water got boring quick, so instead of juices or other things diet soda kept me busy from eating and I actually lost 3lbs during the saga. I also tried to make better choices at the write-ins. · There’s a Christmas surprise for my readers in the works. 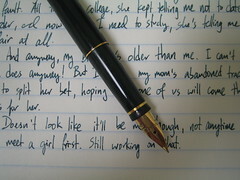 · Writing and submitting two short stories for an inspirational contest in March. · Editing and submitting one of my books for another inspirational contest in June. · Waiting and letting all of you know of the results of all these submissions. · Continue to inspire all my readers as I get inspired myself through this blog. I thank you all for your patience and support. The glory goes to God, I only show up with my laptop and my fingers. There was nothing funny that every happened in the chatroom. Nothing at all. First of all thanks for the visit. I can see how you could perceived that as for the most part you were the target of the fun. LOL! You’re a great sport and an awesome ML!! I like this. Your confidence in God is really starting to shine through. I pray all grace abounds toward you.